OK, here it is, my pricy leased piece of land where my open stable shall sprout - well, and now? Now then, I need a box for each horse, more on this on the following page - but above all I need a fence around my open stable, elsewise everyone's running in and my horses out! Play up, how does my fence look like and where do I obtain it? We made quite good experiences with pressure impregnated wood (and rather poor with non impregnated) - see picture on the left. Impregnated wood keeps up some (few) years, but of course eventually becomes unsound and must be replaced. This also depends on the soil conditions, we do have a sand ground that dries up quite fast. Old railway sleepers (right picture) are much more durable of course but this is due to the questionable chemicals they have been soaked with. Essentially this is hazardous waste and the horses should better not gnaw at them. Since some time solid plastic poles made from recycling material are being offered. We consider to tentatively plug a couple of these poles, so far be do not have any experience with them. As a fencing for horses has to be at least(!) 1,20m high (else you will risk your insurance coverage, for show jumpers even 1,20m is not sufficient) you will need poles with a length of 2m or even 2,50m. As well they shouldn't be too thin, mostly we use some with a diameter of 10cm. To affix the poles with an acceptable effort a drill is essential. If you don't have access to a tractor with a pole jigging machine this can well be done with a manual drill and a sledge hammer. We placed the poles with a distance of 3m. We bonded the poles with two or three rows of half-palisades. These are usually obtainable with a length of 3m, per order also of 4m. 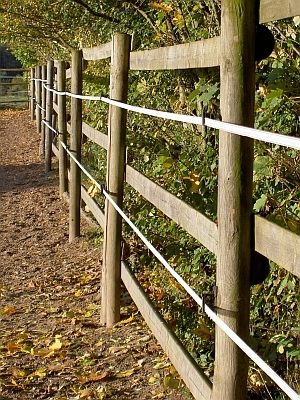 With this you will gain a somewhat more stable fence which besides represents a visually more solid barrier for the horses and is not immediately open because something ruptured somewhere. Additionally we equipped the fence with two rows of electric strips. We prefere electric strips to tightropes as again these do yield a visually more solid appearance. Concerning the durability there seems to be no big difference, after a couple of years in both cases something has to be replaced because the thin incorporated bunched conductors break and the current flow breaks down. However you should refrain from using bare wires as conductors, horses can spot them very badly and if they entangle themselves in it severe injuries loom! Barbed wire or the like is unadmissible due to the risk of injury since for quite some time anyway. At some spots of our fence we placed an additional third electric strip very low at the bottom. This is not because of the horses but to keep away loose dogs and wild pigs from our paddock, unfortunately on and off a problem. There's no mains current available in out stable, thus we depend on alternative solutions. For many years we used small eletric fence energizers powered by 9V dry-cell batteries. However these do have a very small percussive energy and as over time the plugged fence line length constantly rose more and more, someday something more powerfull was needed. 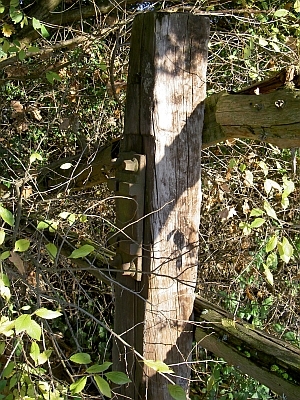 An electric fence energizer powered by a 12V lead-acid accumulator yields a significantly higher percussive energy, however it needs to be recharged noticeably more often. You have to take great care to recharge before the battery voltage drops below the exhaustive discharge threshold of 12,1V. An exhaustively discharged lead-acid accumulator will be permanently damaged and breaks. Better devices premptively automatically shut down, before the battery is exhaustively discharged. Thus, such a protective circuitry is recomended. Borne in mind that depending on the capacity each 9V dry-cell battery costs between 30 and 40€, a 12V-device has amortized already after few charging cycles. Equipped like that you created a usable but still affordable fencing for your open stable, the first step for the construction of the own open stable. We'll continue with the stabling.